1 [web site]: LATEST NEWS!!!! FINANCE MINISTER ANNOUNCES NEW FEDERAL REVENUE INITIATIVE!!! 1 [web site]: THE NIGERIAN FINANCE MINISTER HAS LAUNCHED A NEW REVENUE RAISING PROJECT TO FULLY FUND NIGERIA'S FEDERAL BUDGET. 1 [web site]: "IT'S SIMPLE," HE EXPLAINED IN AN INTERVIEW. "WE'RE NOW ACCEPTING PAYPAL DONATIONS. IF WE CAN RAISE ENOUGH TO COVER THE FEDERAL BUDGET - ABOUT $4.6 BILLION - THEN I WILL BE ABLE TO QUIT MY JOB AS FINANCE MINISTER AND DEVOTE MY ENTIRE TIME TO INTERNET REVENUE-RAISING PROJECTS. Notable webcomic artist Randy Milholland of Something Positive recently tried to collect a year's day-job salary from PayPal donations (only US$22,000 in his case, not $4.6 billion). Amazingly, he managed to do so. He said that if he achieved his target he'd quit his day job and concentrate on improving the quantity and quality of his webcomic work. Pretty cool, huh? If you have a buck or two to spare, why not go help him out a bit more? Oh, and yes, Nigeria's federal budget is US$4.6 billion, as taken from the CIA World Factbook. But the Nigerian Government's official website is actually at http://www.nigeria.gov.ng/, not the URL shown in the strip. 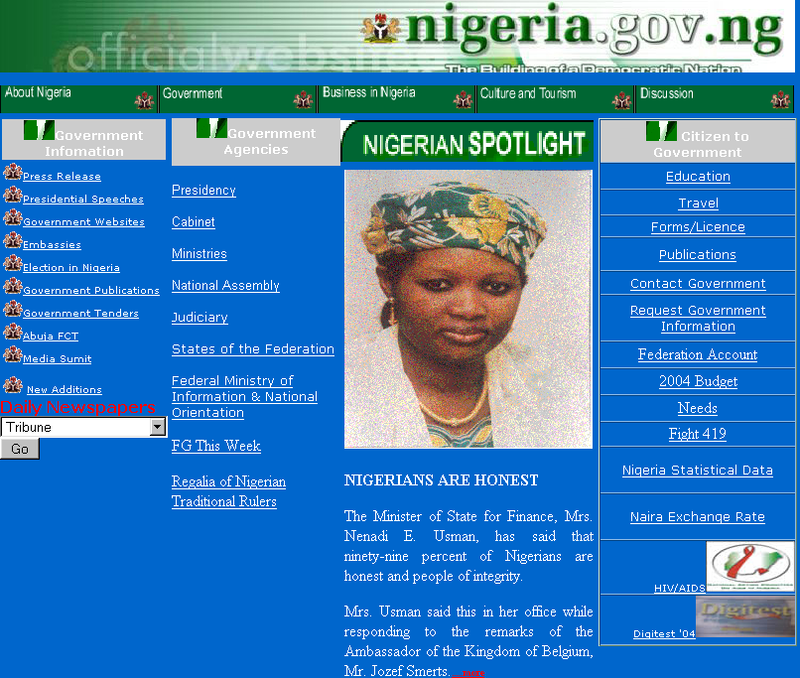 The day this strip appeared, the official Nigerian Government website looked like this. I kid you not; that's an actual screen capture. Now if we take at face value what the real Nigerian Finance Minister says on that page, then there are over 1.3 million dishonest Nigerians. 2013-06-11 Rerun commentary: Wow. That's a Netscape Navigator browser window. I remember when that was an amazingly cool new things, and people were switching over from NCSA Mosaic. Talk about a time warp. Oh, I just love the idea of an official national government's web site with a PayPal donate button on it. EDIT: Huh. Someone pointed out to me that the browser is Mozilla, not Netscape. See if you can figure out how they figured that out. Me, when I went to write this rerun commentary, I saw the wheel icon and thought to myself, "Damn, that's either Netscape or Mozilla, but I can't remember which. How the heck am I going to figure that out?" And then I went on a web search for the logo and eventually concluded it must be Netscape. Shows you how much I look at the comic before writing stuff about it! Last Modified: Saturday, 15 June 2013; 16:45:42 PST.